I bought the Voyager direct from the factory in Crickhowell in 1994. 04 was the show bike which appeared at the 1989 NEC show on the Avon stand – if I remember correctly it was to feature the first Avon tubeless tyres. From the very start Royce Creasey has provided his in-depth knowledge and engineering skills in solving any problems, for which I am very grateful. I’ve now retired from General Practice, but the huge boot and excellent weather protection meant that visiting patients could be brightened up by taking the Voyager out for a blast! A growing family and work pressures meant that the Voyager never really got much use, and now a back problem means stopping riding. The Voyager is exceptionally comfortable to ride with safe predictable handling. Top speed is over 100mph – to be honest I’ve rarely gone much over 85 (on the autobahn, of course). At low speeds, the approx. 600lb weight makes for heavy steering, but this isn’t noticeable over 30mph. Fuel consumption is about 60mpg. 04 remains pretty standard – the original head cowling was apparently lost early in its career as a show bike, and a replacement has been fitted. The five Voyagers were production prototypes and proved to have inadequate radiators. 04 has an additional car heater matrix plumbed into a space in the boot to solve this issue. Otherwise it is standard and retains the factory SU carburettor. There is a comprehensive history file including original sale documents, previous MOTs, dynamometer print-outs and correspondence concerning updates from the designer Royce Creasey. One of five production prototypes made by SCL Ltd., at Crickhowell, Powys, Wales in 1989. This is the vehicle shown on the Avon Tyres stand at the 1989 NEC show. Chassis. steel tube and sheet fabrications, using engine as stressed member. Bodywork Polyester-based GRP, rubber mounted. Two seats, Large lockable boot, heater. Twin 5" Cibie headlights. Twin Renault Savannah rear lights. Lever operated centre stand, side stand. One owner since new, the vehicle is essentially 'standard'. Basic set up was done by Royce Creasey immediately after it was bought from SCL by the doctor. A new clutch was fitted a few years ago. It has registered 12,610 miles and has an MOT valid until 30th. September 2016. The oil and filter where changed when this MOT was done in September 2015. 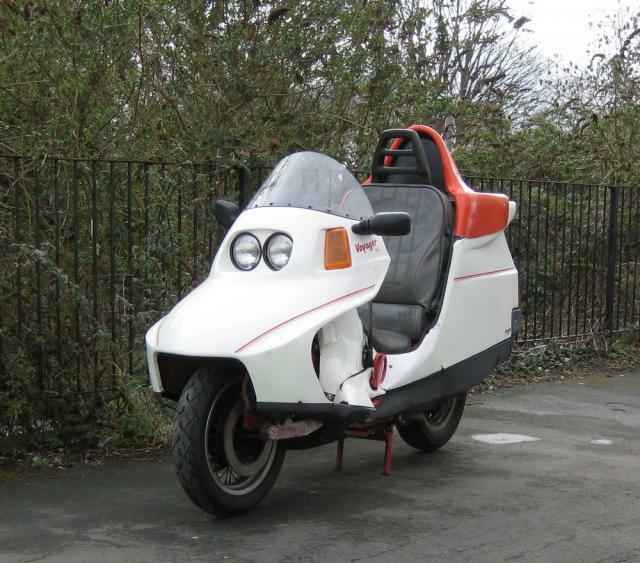 It is in tidy, 'as used' working condition and currently on SORN (which must be renewed by any new owner) so it cannot be used on the road before being taxed. It is otherwise available for inspection, including running the engine etc. Voyager 04 is offered for sale for £15,000. Highest offer received up to the end of April 2016, at or above the asking price, will secure the vehicle on payment. Sale to a highest offer below asking price will be at owners discretion. Any number of offers may be made and highest offer at any point will be made known to previous highest offer. Payment by bank transfer. Sale complete when funds arrive in sellers bank account. Sold as seen and approved. Buyer collects. Delivery available at buyers cost and risk in UK mainland.